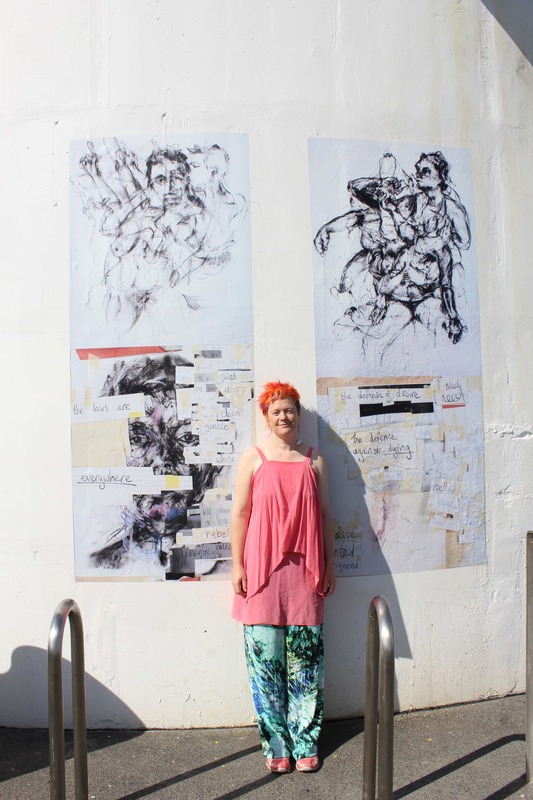 We caught up with Artist Sian Torrington to learn a little more about her current exhibition ‘Intimacy stages / Active Empathy’ running alongside the Auckland Pride Week and Pride Parade. 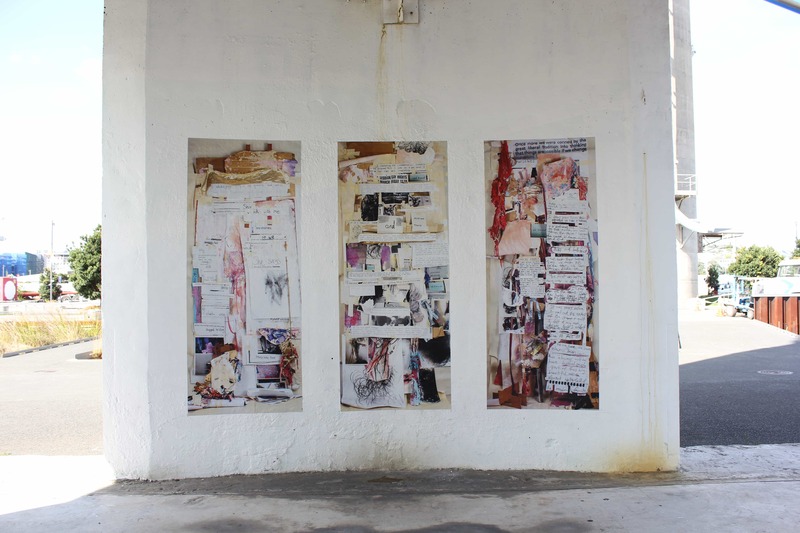 We helped Sian with her installation at Silo 7, Silo Park, Auckland. ROOSJE: Sian, can you tell us a little bit about what ideas and concepts motivate your practice? SIAN: I make drawings and sculpture, as well as large scale installations. I’ve always worked across different media, with movement, action, expression and the body as constants. Expression for me is what motivates my practice, and I think we need more of it in the world! My practice is hot, passionate and alive. It’s complicated and always everything is connected to each other, just like human life. This recent project We Don’t Have to Be The Building, is all about connections and intimacy. It grew from drawing myself and using fluid, stuck together drawings to express gender fluidity and sexuality. I then made a piece of writing with my partner, and then developed the concept into a large scale community engaged project of drawing, sculpture, research in archives and conversations to discover my whakapapa through queer female activism from homosexual law reform to today. Lately I have been motivated by what kind of role creative practice can have in making connections, building solidarity and particularly empathy between people. Putting this art on the street is a way to share our stories and build compassion, empathy and solidarity through vulnerable, brave and open story telling through writing and images. ROOSJE:Your making process seems to be an important part of your work, can you tell us a little about this; Why does process matter in the context of your work? SIAN: Process is the living part of art making. It’s where the magic but also the mistakes happen. I have always wanted to reveal and share the process because I dislike the idea of artist as more important than anyone else. I think when we see incredible artworks in galleries, it can give a sense that it just happened like that, and we could never do that. Whereas the truth is there was a lot of failures, tears, attempts and insecurity making that art work. I want to build connection rather than distance through my art, and so revealing the process is part of that. It’s saying, this is a human process, just like living: getting it wrong, trying again, having hope. And that it’s not something I do alone. The process is the place where I can invite other people in and we can do it together. It’s scary and that’s good. That’s where the humanness is, and that’s what I want to reach. ROOSJE: You’re running some drawing sessions as part of this exhibition. Why is drawing important to you and what can people expect from these sessions? SIAN: Yes, I have a show open till Sat 25th at Studio One, Toi Tu at 1 Ponsonby Rd. It’s 16 large drawings, and I will also be drawing people for the next three days. This drawing will be a document of this pride parade and the queer, trans*, takataapui people who come and spend time with me being drawn. It’s an intimate process and it’s a way of making us seen. There aren’t many of us in art history and in drawing history, so this is a small resistance to that. It is a way to place bodies and identities that are ignored by art history into a massive drawing and say we are here. And we are multiple. And we are together. Drawing is fast, and you can’t hide your mistakes, and it is related to the movement of the body. And humans have done it for as long as we know we have been here. It’s sound from the dawn blessing, plus from the people involved and me reading some of the writing. It’s gorgeous and a great way to create a personal space while viewing. Our Jim speaks the Truth with Simon Sweetman. Check out the podcast via the link below. Check out the latest TV commercial for Chorus that features Phantom Billstickers pasting up posters for Orcon. You can see us from 0:08 seconds. Nice. Move over Ikea. 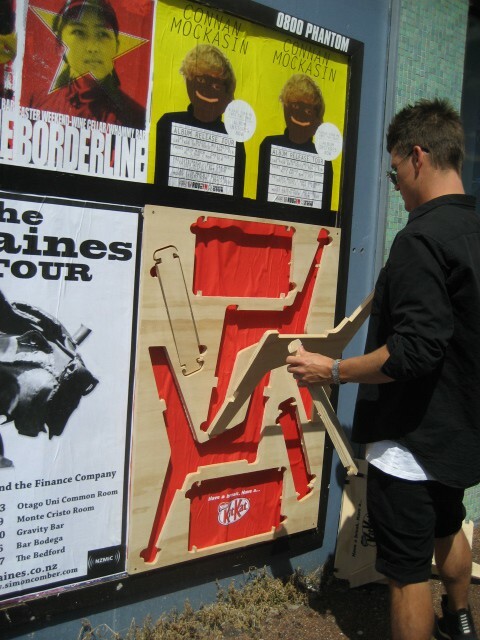 JWT Auckland have brought flat pack furniture to the people in the form of these plywood street posters for Kit Kat. 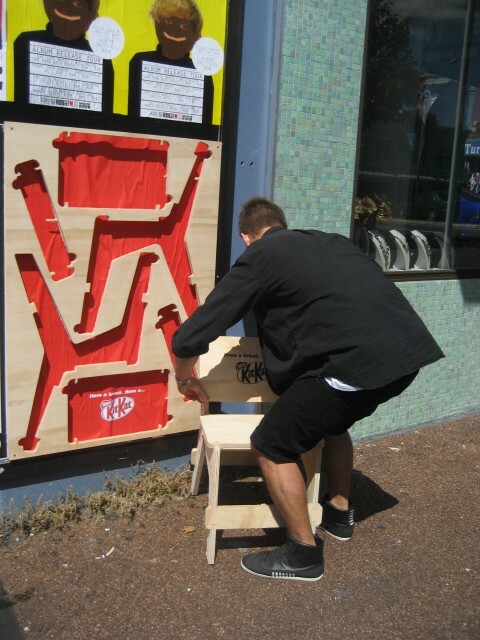 They’re flat pack chairs made from ply that punters can pull off and assemble. Placed on route to summer gigs and at entrances to parks and public spaces they give punters an opportunity to take a break in an unconventional place. 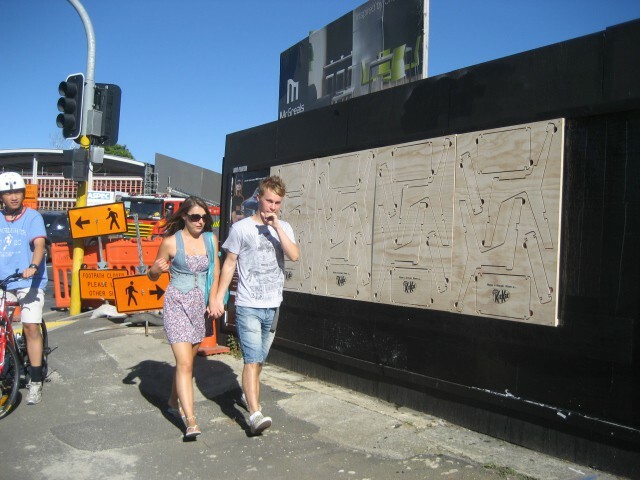 Phantom Billstickers installed Kit Kat plywood street posters for JWT Auckland on our high profile sites throughout the city of sails. Our Marlon filmed himself billsticking in Auckland. See the video below. Directed and stuck together by Marlon Fitzpatrick. Additional Camera Op – Barbara Kinley. Soundtrack courtesy of Warrant of Fatness, Thomas Botting, Nick Wilson, Derek Woodgate, Grant Van de Wetering, recorded live on THE GENERATOR 89FM, HAMILTON 2002. “Slow Down”, “Real”, and “Spit it Up”.